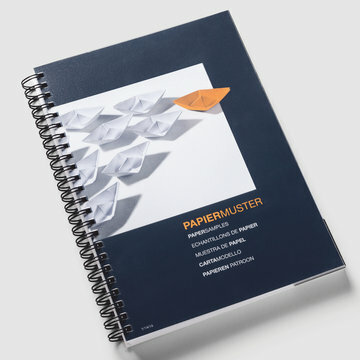 Our paper sample book provides you with an overview of various paper types and finishing techniques from the wide range which we offer in our shop. As an aid for visual and tactile assessment, it can help to reach a selection decision. The sample book in A5 size is spiral bound for easy perusing. All material samples are neutral, our logo is only visible on the detachable cover page. In the "Details" tab, you can learn more about the materials contained in the book. We ask for your understanding that due to new product ideas, the completeness of this sample book cannot be guaranteed. The current paper sample book can be downloaded as a PDF on the “Details” tab. Estimated dispatch within 1 to 2 business days. Should the stock be scarce in the short term, we would inform you at this point.